Vrtlarija Kalići was created as the result of a lifelong love of its owner for all types of plants, especially for aquatic plants, perennials and ornamental grasses. Our goal is to offer a wide range of species that normally can not be found on the market made by larger nurseries and garden centers. Vrtlarija Kalić belongs to a new generation of nurseries; small nurseries, holders of botanical collections, specialized in the production of rare and unusual species. The production of our perennials takes place in the countryside among olive and oak trees with minimal use of chemical products and in complete harmony with the natural environment and climatic conditions. Plants grow all year round in the open field with minimal protection during the winter. Our plants planted in the right place are resistant to adverse envorinmental coditions, durable and healthy and finally they result in a rapid progress and abundant flowering. A small number of plants that we grow requires winter protection and this is ensured by overwintering plants in unheated greenhouses. Our plants do not always look great and lush, like ready-made plants that can be purchased at garden centers. Each plant is different and each has its own personality. But the appearance can be deceiving because our plants are healthy and resistant and will not die after a season or two which is very often the case with imported plants and plants that are sold directly from heated greenhouses. Such plants are forced to grow fast and often are not adapted to the real outdoor conditions. We grow our plants to last so that they can become real beauties in your gardens. Our main collections are: wetlands and aquatic plants with more than 400 species represented; Irises, with more than 400 species and varieties and perennials, especially the genera Lysimachia, Polygonum, Filipendula, Ligularia, Cimicifuga, Sedum, Sempervivum, Tulipa, Phlomis, Miscanthus, Geranium, Salvia and Campanula..
- they provide a wider range of applications so they can be planted in flower flower beds, rock gardens, tombs, roof gardens, flower pots and vases on the balcony, can be used as ground covers and as cut flowers. Perennials will not disappoint you! 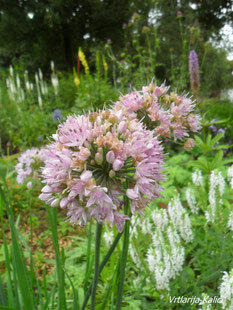 Perennials will impress you every year with their own beauty!